Pigs are social creatures, smarter than most dogs and adept at holding our pennies if cast in ceramic. They fall closer to hippopotamuses and giraffes than people on the evolutionary ladder, but humans can transmit viruses to pigs and even catch them back. Pigs are also susceptible to many viruses humans don’t experience. Whether you have one or a full herd in your life, you can find ways to minimize the risk of influenza and colds infecting your swine. First domesticated 10,000 years ago in Europe, pigs made their way to Cuba with Christopher Columbus in 1493. Spanish explorers released pigs into the wilds of Florida in 1539. Colonists continued the habit of traveling with their European swine as they settled the New World. Pigs currently inhabit every continent in the world except Antarctica. Valued originally as a food source, their friendly nature and intelligence has also created a craving for pigs as companion animals in the United States. Unfortunately, rescue shelters abound with pigs who outgrew their welcome in households not equipped to handle a farm animal as a pet. Influenza A, also known as swine flu, is likely the most familiar virus associated with pigs. It’s a respiratory illness the Merck Veterinary Manual notes is most common to swine herds in the Midwestern U.S. A pandemic strain of the H1N1 influenza A virus infected swine, poultry and humans in 2009. Pigs also fall victim to several respiratory viruses that do not transmit to humans, including other strains of the influenza virus. Pseudorabies is another virus deadly for piglets and transferrable to dogs and cats but not humans. 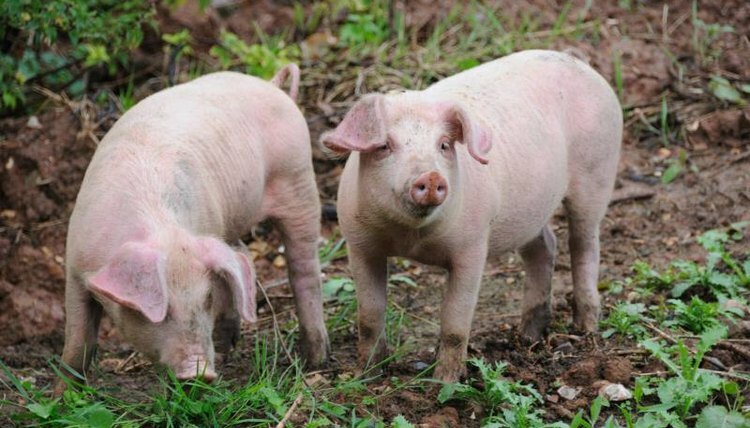 Classic swine fever is highly contagious virus among pigs but thought to be eradicated from the U.S. and developing countries, according to the U.S. Department of Agriculture. Symptoms of respiratory viruses in pigs are remarkably similar to what humans experience when coming down with a “bug,” including fever, loss of appetite, cough and drainage from the eyes and nose. In the case of swine influenza, the Merck Veterinary Manual notes the illness lasts three to seven days and is spread through the herd by pig-to-pig contact. Mortality rate amongst pigs for swine influenza is 1 to 4 percent. As with humans, pigs in the U.S. tend to come down with flus and colds during the colder months. The Centers for Disease Control and Prevention notes that flu vaccines for pigs help but, as with humans, the annual vaccine may be for a different strain of virus than the one affecting pigs in your area. Housing your pigs in a clean, well-ventilated environment, protecting them from extremes in weather and ensuring their diet is healthy may help your pig fight off infection. Vaccinating yourself against the flu may also prevent you from spreading human influenza to your pigs. Washing your hands carefully after contact with an infected pig and isolating a sick herd member may help prevent spreading the virus as well. What Is the Natural Habitat of a Pig? Are Potbelly Pigs Good Pets? How Did Wild Pigs Become Domestic?